Reduces turnaround time with simplification and customization of returns processes; thanks to a centralized network of multi-channel return hubs. Receive your returns, inspect, categorize and report on the status of each. Lets you analyze your returns processing costs including everything from logistics to liquidation. Use this information to determine the most efficient way to manage return issues – be it through replacement or refund. Lets you plan disposition as soon you receive return order. Provide direction – whether the items to be made available for resale, disposed or returned to the manufacturer or supplier, to recover maximum possible value; ASAP. Enhances customer satisfaction; thanks to improved turnaround time. Simplification of customer return & refund processes through good integration of frontend & backend tasks makes up a satisfying e-commerce experience. What is the best Returns Management System? Also, is it necessary to integrate a warehouse management system with a return management system? There are plenty of software available online for managing your returns. You can, as per your business requirements, select software that can manage your returns and automatically update your inventory as soon as the product is back in the warehouse. This is the most important reason why a warehouse management system should be integrated into your returns management system. Along with your returns and warehouse, it is also necessary that a constant count on your inventory be done, always. For the same, you need to have an inventory management software in place. Choose software for your retail business that can cater to every eCommerce demands. How much would a returns management software cost me? Is it really necessary to invest in a software like this if I have a small-scaled business? Product return management is something that highly demands a software specifically made for it. This is your product traveling back to your warehouse, and controlling the same is called reverse logistics management. This, regardless of small- or medium-scale, is recommended for every retailer offering returns. 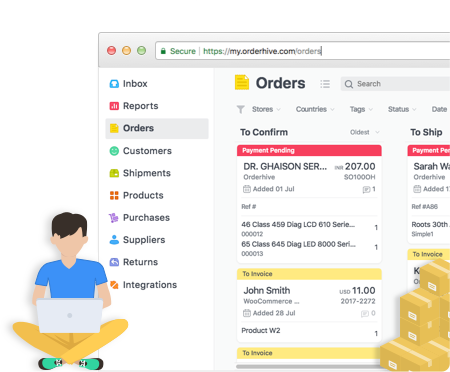 Orderhive’s returns management software comes in three packages – ‘Starter’ at $99.99 per month, ‘Professional’ at $199.99 per month, and ‘Growth’ at $299.99 per month. For the businesses which might need some other tailor-made features, there is Orderhive Enterprise. Ok, so the returns management system will notify me whenever a customer wishes to return a product. How will it help me to initiate the reverse logistics process? Do I need to do it manually or will the software assist me here? A returns management system smartly integrates your business with the marketplaces where your products are listed, as well as connects you with your logistics partners. The moment your customer returns a product, the returns management system will alert you (the seller) and on the same instance alert your logistics partner as well to collect the product from the customer. This will automatically initiate the reverse logistics process. How can I, being a seller, arrange the quality checks when the customer is returning a product? Will my logistics partner help me with it? Every logistics agency has its own set of parameters when it comes to the quality check. A quality checker can be assigned by the logistics agency for the same but is separately charged from the seller. Being a seller, you have to set the price in a smart way that even if the product is returned, there is no impact on the financials of the business. How can I return the money to the customer after the product return is initiated? There are plenty of options available for this. Most of the sellers practice bank transfers, but there are some who also cater to provide cash at the time of returning the product. Whenever the payment is done via ‘cash on delivery’ and a return is placed, a customer always appreciates if the money is returned in cash. If you are a seller listed on a marketplace, there are chances that you might need to act as per the marketplace’s protocols. Marketplaces have started to disburse the payments in their own wallets, just to ensure that the customer is not lost. These are some tactics that marketplaces follow, but if you are a small-scale seller, eyeing for customer satisfaction, make sure that the money is properly returned to the customer.